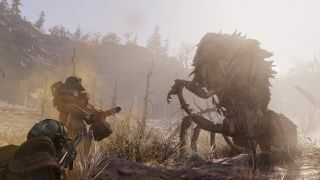 Bethesda has published the notes for the Fallout 76 patch which will emerge later today – or may even be out by the time you’re reading this – and comes to PC players first, delivering a raft of tweaks and important performance and stability improvements (console gamers will get it next week). Bringing the PC version number up to 1.0.4.13, the new patch implements a number of in-game performance boosting measures, as mentioned, including better frame rates when in an area which has a lot of scorched statues. A gremlin which would cause the background to freeze up when you’re reading a note has also been squashed. In terms of reliability, both the game client and servers have benefited from a number of stability tweaks, and a bug where the PC game would hang and permanently leave you on the load screen when attempting to join a server has been resolved. Other nifty bonuses include the Power Armor light having been made brighter, a number of useful balance tweaks, and a change on the player-vs-player front that means when you open another player’s locked container it will now be considered a PvP action. There are over 150 bug fixes in total, and the PC patch weighs in at 500MB, which is considerably tighter than the console updates which are expected to be around 4GB when they roll out next week. Also, remember that last month Bethesda announced that anyone who had bought Fallout 76 during 2018 would get a free copy of Fallout Classic Collection on PC at some point in January 2019? Well, that day has arrived. As Eurogamer points out, to get your goodies, fire up Bethesda Launcher, log in to your Bethesda.net account, and you’ll find the trio of freebies in the Games menu. The Classic Collection consists of the original Fallout game along with Fallout 2, and Fallout Tactics.